The default breakpoint for switching to mobile layout. This will be used if it is not overridden in the individual website and page levels. The preset widths for creating responsive images. For example a total of four images with widths above will be created from the selected image. The height of the images will be adjusted in aspect ratio. For example, if the selected image is of size 1920x1280, then these four images will be created by resizing it to 320x213, 768x512, 1024x683 and 1280x853. Use data URI for the specified image width. Data URI is a base 64 encoding which embed an image into a page so that the page can be rendered without requesting the loading of the image from the website. The quality used by creating responsive images from a JPG. 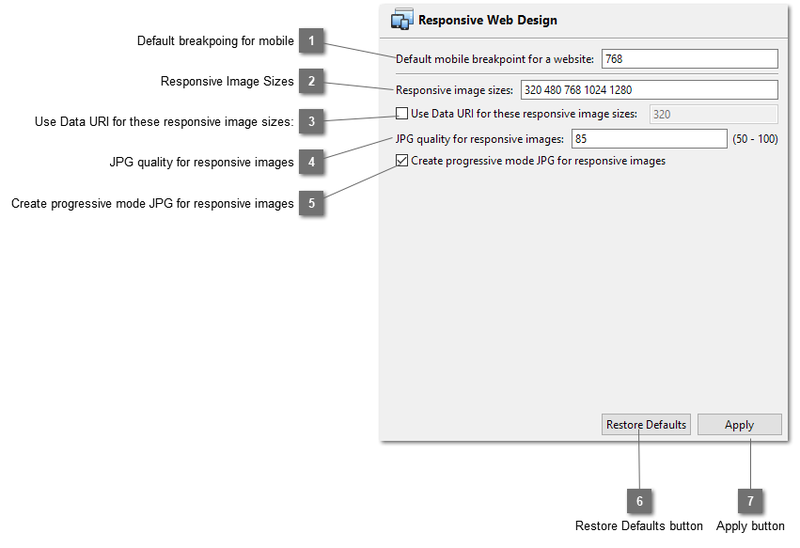 Select this option to create a progressive mode JPG when creating responsive images from a JPG. Restore the default values of the settings.